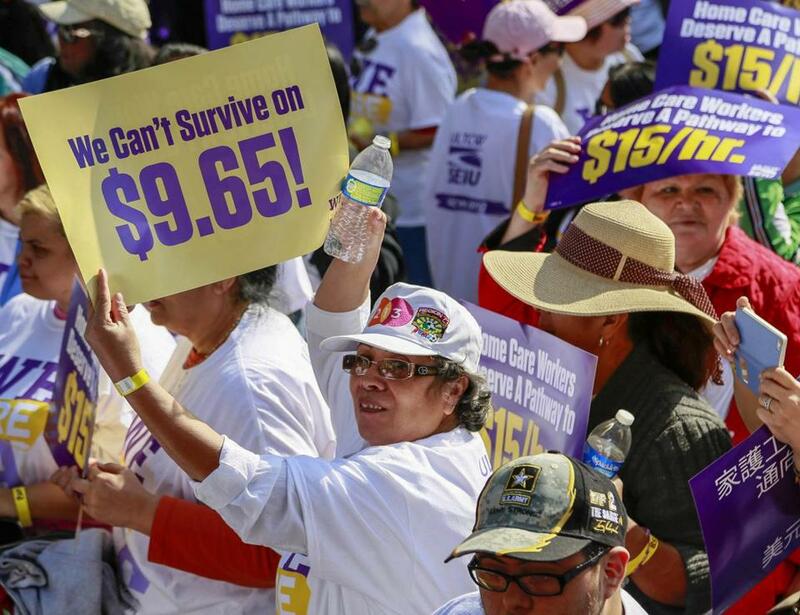 Home health care workers rallied for better wages in Los Angeles in April. After five months of negotiations with the Baker administration, more than 35,000 personal care attendants in Massachusetts won an agreement for a $15-an-hour starting wage, the first state-level victory in a nationwide campaign to raise low-wage workers’ pay. The state’s deal with Service Employees International Union Local 1199, which represents the workers, will boost starting pay in stages from $13.38 to $15 an hour by July 2018. “It makes Massachusetts the first state to guarantee a living wage for home care workers, a fast-growing, crucial part of our health care system where workers have been underpaid for far too long,” said Paul Sonn, general counsel for the National Employment Law Project, a New York workers’ rights group. The personal care attendants covered by the agreement bathe, cook for, and run errands for elderly and disabled clients who qualify for Medicaid, which is funded through the state. “The administration is grateful to SEIU 1199 members and leadership for their good faith negotiations,” Jim Conroy, senior adviser to the governor, said in a statement. Home health care is among the fastest-growing sectors in the country. In Massachusetts, home health care jobs are expected to grow by nearly 40 percent in the next decade, compared with an 11 percent increase in overall employment, according to the National Employment Law Project. Statewide, there are more than 50,000 home care workers, including those who work for private agencies. Personal care attendant Rosario Cabrera, 31, of New Bedford, said the raise means she will be able to pay her bills on time, provide for her two children, and maybe even take a vacation. Cabrera works seven days a week caring for two elderly women, and even with the money her husband makes as a machine operator, her family struggles to get by. Home care workers got involved in the national “Fight for $15” movement a year ago, joining forces with fast food workers, retail employees, and others demonstrating for higher wages and the right to unionize. Since then, home care workers have been holding demonstrations, letter-writing campaigns, and community forums around the state. The home care workers have called off a 15-hour picket in front of the State House scheduled for June 30. The wage hike will allow some workers to give up second jobs or get off public assistance, said Veronica Turner, executive vice president at 1199 SEIU. The personal care attendants will get a 30-cent hourly hike effective immediately, and discussions will begin by Jan. 1 to work out a series of wage increases to get the workers to $15 an hour within three years. Since the SEIU-backed “Fight for $15” campaign began in late 2012, a wave of $15-an-hour mandates have been passed, including citywide laws in Seattle, San Francisco, Chicago, and Los Angeles. In New York, Governor Andrew Cuomo convened a wage board to raise the pay of fast-food workers across the state. Many employers say a $15-an-hour minimum wage could cripple their businesses, making it harder to hire new workers and stay profitable, especially as other costs rise. In Massachusetts, employers already have some of the highest energy and labor costs in the nation, with a minimum wage rising to $11 an hour by 2017 and a new law going into effect next week that requires employers to provide sick time to all their employees.